Latrodectus hesperus, known commonly as the black widow spider in North America. Researchers at Northwestern University and San Diego State University have unraveled the complex process of how black widow spiders transform proteins into steel-strength fibers, potentially aiding scientists in creating equally strong synthetic materials. 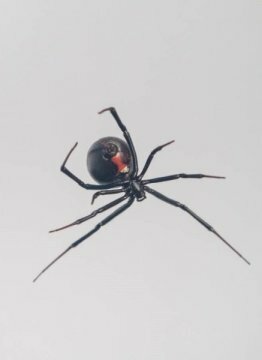 Researchers at Northwestern University and San Diego State University (SDSU) have better unraveled the complex process of how black widow spiders transform proteins into steel-strength fibers. This knowledge promises to aid scientists in creating equally strong synthetic materials. Black widow spiders and their relatives, native to temperate climates in North America, Europe, Asia, Australia, Africa and South America, produce an array of silks with exceptional materials properties. Scientists have long known the primary sequence of amino acids that make up some spider silk proteins and understood the structure of the fibers and webs. Previous research theorized that spider silk proteins await the spinning process as nano-size amphiphilic spherical micelles (clusters of water soluble and non-soluble molecules) before being funneled through the spider's spinning apparatus to form silk fibers. However, when scientists attempted to replicate this process, they were unable to create synthetic materials with the strengths and properties of native spider silk fibers. "The knowledge gap was literally in the middle," Northwestern's Nathan C. Gianneschi said. "What we didn't understand completely is what goes on at the nanoscale in the silk glands or the spinning duct -- the storage, transformation and transportation process involved in proteins becoming fibers." Gianneschi is the Jacob and Rosaline Cohn Professor in the department of chemistry in the Weinberg College of Arts and Sciences and in the departments of materials science and engineering and of biomedical engineering in the McCormick School of Engineering. He and Gregory P. Holland, associate professor in the department of chemistry and biochemistry at SDSU and the author of more than 40 papers on spider silk, are the paper's co-corresponding authors. The research will be published online the week of Oct. 22 in the Proceedings of the National Academy of Sciences (PNAS). Utilizing complementary, state-of-the-art techniques -- nuclear magnetic resonance (NMR) spectroscopy, the same technology utilized in MRI, at SDSU, followed by electron microscopy at Northwestern -- the research team was able to more closely see inside the protein gland where the silk fibers originate, revealing a much more complex, hierarchical protein assembly. This "modified micelles theory" concludes that spider silk proteins do not start out as simple spherical micelles, as previously thought, but instead as complex, compound micelles. This unique structure is potentially required to create the black widow spider's impressive fibers. "We now know that black widow spider silks are spun from hierarchical nano-assemblies (200 to 500 nanometers in diameter) of proteins stored in the spider's abdomen, rather than from a random solution of individual proteins or from simple spherical particles," Holland said. If duplicated, "the practical applications for a material like this are essentially limitless," Holland said, and could include high-performance textiles for military, first responders and athletes; building materials for cable bridges and other construction; environmentally friendly replacements for plastics; and biomedical applications. "One cannot overstate the potential impact on materials and engineering if we can synthetically replicate this natural process to produce artificial fibers at scale," said Gianneschi, who also is the associate director of the International Institute for Nanotechnology and a member of the Simpson Querrey Institute and the Chemistry of Life Processes Institute at Northwestern. "Simply put, it would be transformative."